In the dry, dry, dry landscape of the early-00s rock scene, there were only a few stand-outs worth listening to. Of those, only a handful were actually heard on the radio. 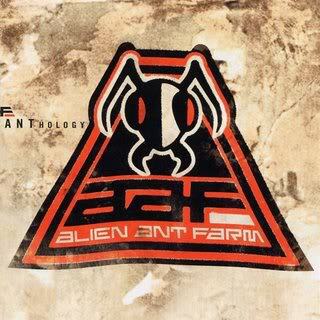 One of those bands was called Alien Ant Farm, whose 2001 album ANThology topped the charts thanks to their ubiquitous cover of the Michael Jackson classic "Smooth Criminal." Unfortunately, it was the band's only significant radio hit. Because AAF's members were friends with the members of the comparatively more successful band Papa Roach, they were inevitably grouped-in with that band stylistically, along with other "nu metal" bands such as P.O.D., Linkin Park, and so forth. Alien Ant Farm, however, had virtually nothing in common with those bands. This might explain why they never achieved the same level of commercial success. I am utterly certain, however, that it is also why they never enjoyed the critical success that I think the band deserves. I bought ANThology on a bit of a splurge. I was a fan of their minor radio hit "Movies," but not really a fan of the "Smooth Criminal" cover. I thought, What the heck? How bad could it be? What I expected was basically a Papa Roach album, with one good song on it in "Movies." What I got instead shocked me. Even from their radio hits it's obvious that the band's rhythm section, consisting of drummer Mike Cosgrave and bassist/songwriter/guitarist/keyboardist Ty Zamora, was several notches above that of the typical nu metal band. When you actually take a deep dive into ANThology, what you discover is a funky, groovy, technically proficient band who lists Primus and Peter Gabriel among their biggest influences. Unbeknownst to the musically illiterate masses, Alien Ant Farm was the real deal. The album's virtuosity is kept in check on the album, however, by a strict adherence to radio-ready song formats and the band's proclivity for subtlety over flash. Take, for example, their other minor hit, "Attitude." The song opens with a clever, weaving guitar line that drops off with an echo into a minimalist bass line, while Cosgrave carries the verses with delicious snare drum work. In the background, we hear congas as singer Dryden Mitchell's voice rises with an emotive quality that was largely absent from the airwaves at the time. As the chorus unfolds, rich vocal harmonies rise carefully behind those same emotionally charged vocals. Throughout the song, the guitar outlines the chords of the piece without stepping on the complex rhythmic underlay or vocals. It's a testament to the kind of attention to detail found throughout ANThology. The album's unreleased songs deepen the groove, hit the guitars much harder, and highlight an important aspect of the band's music that was not evident on their radio releases: harmonic complexity. Alien Ant Farm has a knack for good song arrangements. Having only three instrument players in their live act, they'd have to be. On songs like "Stranded," the listener perceives a band playing, essentially, chords, but in truth what is often going on is that guitar, bass, and vocals are all playing single note lines, their roles within the implied chords changing as the harmonic movement demands. First the bass plays the root note, then slides up a step and suddenly we're hearing an inversion. Holding it all down, all the while, are Mitchell's complex but musically pleasant melodies. Alien Ant Farm wasn't, by any means, the first band to write music like this, but in 2001, they stood alone, injecting intelligence into a musical landscape otherwise consisting of J.Lo singing duet "remixes" with Ja Rule. Hey, if that's your bag, more power to you, but for rock fans, the search for capable players at the time was quite daunting. And, unfortunately, most people searching at that time overlooked one of the best albums of the time. ANThology is one album from the early-aughts worth revisiting.